We're not surprised to hear that celebs spend two, three, or four times our rent on a red-carpet ensemble. The jewels, the gowns, the hairstylists — that stuff doesn't come cheap. But we thought their manicures would have to top out around $50, right? Wrong. Kelly Osbourne had the honor of wearing a whopping $250,000 on her nails at the Emmys on Sunday. We all know the frustration of waiting completely still for a full hour for some complex, painstaking nail art to dry — but this makes us look like wimps in comparison. Honestly, we commend her for not cracking under the pressure of having so much cash on hand (literally). Why so expensive? 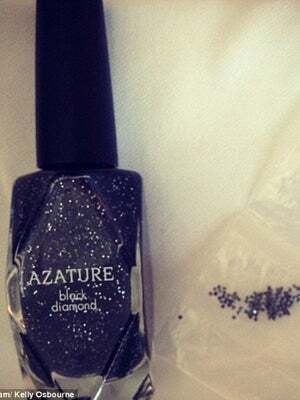 The polish contains real black diamonds, and only one bottle was manufactured, though the non-famous can buy a budget version for $25. Image via Instagram, The Daily Mail.